Dr. Greger from NutritionFacts.org always recommends eating your daily dose of cruciferous veggies, and this salad makes it EASY! Super delicious! 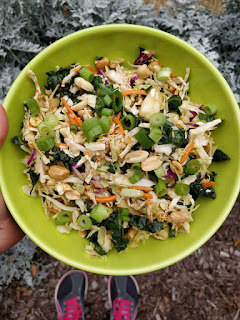 Mix slaw mix, kale, pears, and peanuts in a large bowl. Whisk together the lemon juice, vinegar, soy sauce, and date syrup for the dressing. Drizzle some dressing on the salad, tossing it well as you do. There should be plenty of extra dressing for one or two more salads.